Joan Didion’s South and West: From a Notebook is a 1970s-era artifact that has found its proper home in the anxious world of 2017. In the spring of 1975, Joan Didion returned to her alma mater, U.C. Berkeley, to deliver the school’s prestigious Regents Lecture before a crowd of (mostly young, mostly female) admirers. She began with an admission: “Of course I stole the title for this talk, from George Orwell.” The lifted title was “Why I Write.” She had taken it, she said, because she liked its sonic resonances—i, i, i—and the way those three steady beats, first-person by default, captured the intimacies, and also the egocentricities, of writing. Didion had chosen her profession, she told the crowd, because, though she had tried to live in the realm of ideas—to be a professional academic, at Berkeley or somewhere like it—she had always found herself incorrigibly preoccupied with the messier facts of the world: the way a yellow curtain will catch the wind on a soft summer day, the pattern the lights take at the particle accelerator near the Berkeley campus, the particular way that petals, having lost their bloom, fall and gather on a floor. She had tried many other things before it became obvious that, for Joan Didion, writing was the only thing. It’s easy, nowadays, to forget all that. The Joan Didion of 2017 is best known not so much for selling people out as for being sold to them. Didion, particularly after the releases of The Year of Magical Thinking in 2007 and Blue Nights in 2011 introduced her to new audiences, has ascended to a very particular place within celebrity’s arbitrary firmament: She is now an icon, and a brand, and a Living Legend. There was the Broadway play she wrote, in which Didion herself was played by Vanessa Redgrave. There was that Kickstarter campaign (purpose: to fund a Didion documentary, co-directed by her nephew, Griffin Dunne; reward for a pledge of $350: “write a two-page letter to Joan and her family will read the letter aloud to her”). There was that internet-breaking Céline ad, featuring Didion wearing both her trademark sunglasses and a daVincian scowl. These are in many ways logical extensions of Didion’s long-running relationship with Hollywood and its idiosyncratically unified modes of fame. She’s been a screenwriter, and a denizen of Malibu, and of New York, which is to say an American celebrity in an intriguingly conventional way. She’s written about John Wayne, and Woody Allen, and Ronald Reagan. 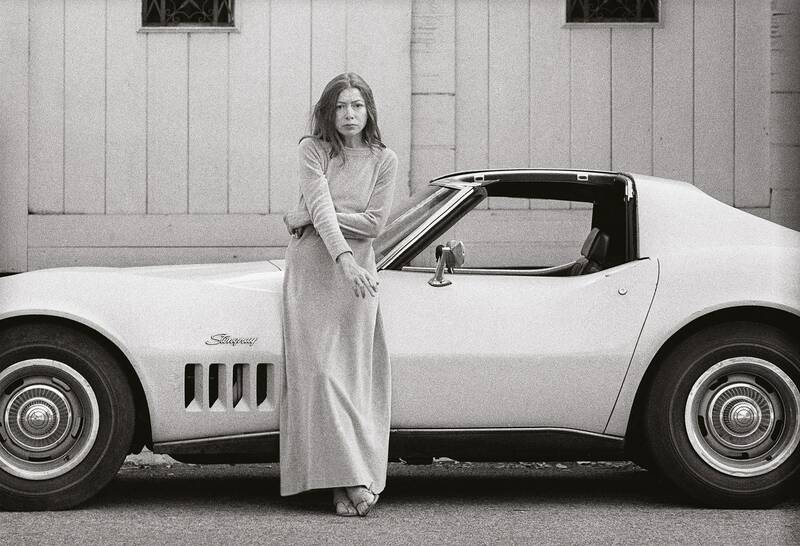 The most iconic picture of her early career—the artist, posed in front of her Corvette Stingray, grimacing elegantly, a cigarette dangling lightly from her fingers—was shot by the celebrity photographer Julian Wasser. She has been famous for being literary, yes, but she has also been literary for being famous. What’s new, though—what coincided with the release of Didion’s latest books, and their attendant attentions—is the internet, with its lusty appetite for words and its platforms’ way of both fetishizing authorship and ignoring it. Didion’s quotes dangle, disembodied, from their original texts, on Goodreads and Brainyquote and in your literary cousin’s fanciful email signature. Fashion blogs celebrate Didion’s famously sparse packing list. The artist Alice Lancaster added Didion’s face to the back of VEDA’s $1,200 leather jacket. In recent years Didion has been, Haley Mlotek argued for The Awl, “mined for commerce, mass distribution, and cynical re-appropriation by brands, in order to be sold back to the next generation as pure, complete, whole elements of beauty and inspiration.” Which is to say that she has been subject to the same fate that most artists will be, these days. Denizens of 2017, so eager for mentors and meaning, are doing to Didion roughly what she did to Orwell in 1975, and for roughly the same reason: They take—and they sell—and they sell out—because they love. The cheery appropriations of the Didion Industrial Complex, of course, make for some rich irony. Didion spent much of her career—as a journalist and as a novelist—mocking people for embracing the notion that one can buy one’s way into good taste. (“Self-absorption is general, as is self-doubt,” her 1979 essay on Woody Allen begins. “In the large coastal cities of the United States this summer many people wanted to be dressed in ‘real linen,’ cut by Calvin Klein to wrinkle, which implies real money.”) Now, though, as New York’s Molly Fischer noted after the Céline ad came out in early 2015, it is Didion who has become a signifier of literary chic, Didion who has become a fashion to be worn—Didion who has become a product that is conspicuously consumed. The author, at 82, in that represents a very 2017-resonant fusion of girlish longing and jaded ennui, a sense of the world’s promises and also of its great capacity to leave those promises unfulfilled. She represents as well a personified version of one of the rallying cries of the American feminism of the late 1960s: that the personal is political. Her work is infused with the very subversive idea that words, especially when one chooses them oneself—i, i, i—can be softly weaponized. Words, if one cares enough to find the right ones, are capable at once of taking the measure of things and of cutting them down to size. So, then, a classic cash grab, in the vague and wistful manner of Go Set a Watchman, only with fewer devastating implications for people named Atticus? But there are other questions, too—questions that are particularly relevant when a writer’s journals are released with the writer’s consent. How unvarnished is the stuff of South and West, as compared to what one would find in Didion’s original, type-written scrapbooks? Is this book the notebook, or a more polished work merely inspired by the original document? And also: Why didn’t the prose turn into pieces? And why did Didion try to learn about the South via a trip to a roadside Reptile House, and dips in motel pools, and a visit to a cosmetology school, and a visit to a laundromat, where “women are sisters in misery”? Why, as she writes, was there “no reportorial imperative to any of the places I went ... no celebrated murders, trials, integration orders, confrontations, not even any celebrated acts of God”? Why did Didion, having seen a woman on the campus of Ole Miss—a woman who “was wearing an Afro and a clinging jersey, and she was quite beautiful, with a NY-LA coastal arrogance”—lament in her notebook that “I could not think what she was doing at Ole Miss, or what she thought about it”? Why had the journalist not simply asked? Was anyone ever so young? Didion took the trip at a time when her fame was still new and young. Slouching Towards Bethlehem, her collection of reported and personal essays, including “On Keeping a Notebook,” “Goodbye to All That,” and the titular report on the aimless life of the high-’60s Haight, was published in 1968, when Didion was in her mid-30s, and had catapulted her, even more than her 1963 novel Run, River, to national attention. The author was under a great deal of pressure to find the stories that would, by the vague forces of metaphor, explain the era to itself and to future generations. She needed direction. So: South. All the polish, though, amounts to a story that is self-consciously not a story. South and West is Didion’s lightness with language put to the service of impressionistic observations, transcriptions, and personal asides that have been converted into that most marketable of literary totems: the “slim volume.” In that, it is the logical extension of the Didion industrial complex. But it is also, in the most satisfying ways as well as the least, prose in search of a purpose. “We tell ourselves stories in order to live,” Didion wrote, as the opening sentence to “The White Album.” It’s classic Didion: the everyday thing mingling with the epic one, the firm belief in the salvific power of words, that initial, insouciant “we.” The sentence is the title of Didion’s 2006 compilation of nonfiction; it is supposed to be the title of the seemingly still-Kickstarted documentary. It’s a sentence, though, that—even detached from its literary context—chafes. There’s the presumption of it (who is the “we,” here? ), but there’s also simply the questionable conviction that stories are, in fact, leveling, and unifying, and life-affirming. South and West, as it happens, arrives on the scene during a moment of deep anxiety, in American culture, about stories—and, with it, about the very things Didion has so effectively dissected with her perfectly chosen words: power, privilege, the way those things have of shaping and shading the world. Story itself, in that context, has become self-consciously political—and not just in a “the personal is political” way, but in a more interrogative one. Who has the power to tell “our” stories? Who should have it? When telling the story of another, where is the line between appreciation and appropriation? Where does my story end, and yours begin? These were questions Didion asked, too, throughout her career. When she suggested, to that crowded lecture hall in Berkeley, that writing could be an act of violence as well as one of vulnerability, they were what she was getting at—notions of ownership, and authority, and the double edges of truth. The “we” who are alive in this moment in American history are newly recognizing what was always so deeply clear in Didion’s penetrating prose: that to tell a story—to tell someone’s story—is to have an impossible power. The Egyptian god Thoth was the god of writing; he was also the god of magic. But you could also read South and West, in all that, as an act of radical humility—an offering of literary detente from a writer who so perfected the art of secret bullying. “I was underwater in some real sense, the whole month,” she admits to herself and, now, to us. It’s an admission that, lyric writer as she is, reads as redundant; her notes are infused with the sense of darkness, closing in. In the South, where “they have mastered the art of the motionless,” simply to breathe in the humid air is, in her sense of things, to feel oneself drowning. Of course, those who are at home in the South will likely feel things differently. The most common criticism of Didion’s writing has been that it is too cold; the second-most-common has been that it is too self-centered. (Didion herself has allowed some of that: “I’m not very interested in people,” she once acknowledged.) Here, though, with South and West, are those critiques answered—with the warm transparency of an open notebook, with the humble acknowledgement that even someone of Didion’s caliber is so deeply capable of failure. How fitting that her latest book be a non-story that dares us to consider what it means to be a story in the first place. How fitting, too, that the writer who once called writing “an aggressive, even a hostile act” has given the world a work that acknowledges an even more basic truth: that not all stories are hers to tell.